102 mm/50 Mk124 х 1 pcs. 450 mm Mk64 х 2 pcs. 37 mm Maxim1 х 1 pcs. 37 mm Maxim2 х 1 pcs. Sampson — American Tier II destroyer. Budding American destroyer captains start their journey here with Tier II's Sampson. Sampson has a lot in common with her Japanese counterpart, Umikaze: both are hard to detect; both have torpedo reload speeds that allow them to put seemingly endless amounts of torpedoes in the water; both are fairly maneuverable and devilishly hard to hit. They're far from identical, however. Sampson’s main battery is more usable than Umikaze’s in that the guns traverse and reload faster, though Umikaze’s shells hit harder. V-25 remains the best gunboat destroyer at Tier II thanks to her rate of fire, but Sampson’s guns do well enough for what they are. It's her "other" main battery weapon that that terrifies low-tier battleships: wave after wave of torpedoes. Sampson’s fish are faster than those of Umikaze, and they come just as relentlessly, like clockwork, every 22-23 seconds. They have pretty short legs for torpedoes — only 4.5 km — but that's a handicap that American destroyer captains are advised to get used to early; they won't start seeing torpedoes capable of hitting targets at medium range until Mahan at Tier VII. The extremely short range will require Sampson captains to use islands as cover to approach their targets, or to make near-suicidal head-on charges against ships with far more health and bigger guns. In that sense, Sampson is a perfect introduction to the flavor of the line, though the guns do steadily improve over the next few tiers. Excellent concealment allows her work in very close to targets before launching torpedoes. Low, flush-deck profile makes her a difficult target. Anti-aircraft suite is essentially useless; luckily, she shouldn't see aircraft carriers. Sheds a lot of speed while maneuvering. Main battery reload time is painfully slow. Hull: Upgrade to Hull (B) for a touch more health, improved rudder shift speed, and an extra AA gun. Research of this module unlocks progression to Wickes. Torpedoes: The upgraded torpedoes move notably quicker, as well as hitting a little harder. Their range does not improve. Hull (B) must be researched in order to research this module. Gun Fire Control System: Upgrade to Mk3 mod. 2 for an extra 10% range on the main battery. Hull (B) is the best place to invest early experience gains in Sampson; the extra hit points aren't much, but every little bit helps. Which module upgrade is taken next is up to individual captains. The Torpedo module upgrade doesn't look like much, but a 10% improvement in speed makes her torpedoes much harder to dodge. Captains who are concerned about possible detonations are encouraged to equip Magazine Modification 1 ( ) instead. Preventative Maintenance is the best pick out of the Level 1 skills, to reduce the chances of having her engine knocked out by enemy gunfire. Level 2 offers Last Stand for those times when her engine goes out anyway. Basic Firing Training is probably the best of the lot at Level 3, though Superintendent isn't a bad pick either. Level 4's Concealment Expert makes her even harder to detect and is highly recommended. Investing in Damage Control Party II ( ) and Smoke Generator II ( ) is recommended, but spending the credits (or doubloons) on the premium version of Engine Boost ( ) isn't really necessary. The Sampson-class destroyers were a series of six destroyers built for the US Navy during World War I. 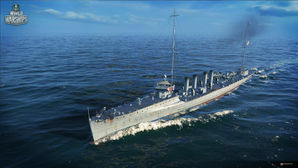 The class was a modification of the O'Brien and Tucker classes, with the primary change being an increase in torpedo firepower. They were the largest and last of the 26 "thousand tonner" destroyers. Launching of USS Sampson (DD-63) at Quincy, Massachusetts, 4 March 1916. USS Rowan (DD-64) running trials, 22 July 1916. Note the ship's very dirty paintwork and incomplete condition, with weights installed in place of her guns. Launching of USS Shaw (DD-68) at Mare Island, California, 9 December 1916. USS Davis (DD-65) anchored off of Hampton Roads, Virginia, 10 December 1916. Sampson anchored off of Hampton Roads, Virginia, 13 December 1916. USS Allen (DD-66) anchored at Queenstown, Ireland, circa 1918. Damage to Shaw after her collision with RMS Aquitania on 9 October 1918. USS Wilkes (DD-67) on patrol during the Prohibition Era, undated. Davis in Boston Harbor on 20 February 1932, during her years of service with the US Coast Guard. Allen underway off Pearl Harbor, Oahu, Hawaii, 17 December 1942. She was the only flush-deck destroyer to serve in World War II. This page was last modified on 15 March 2018, at 19:20.